SPRINGFIELD, Ill. (AP) — What if you were governor of Illinois and didn’t have a thing to wear? If you’re J.B. Pritzker, you look at your daily schedule. During his first six weeks in office, Pritzker’s appointment calendar includes 70 “attire” recommendations for events as varied as bill signings, a state police officer’s funeral, a White House dinner, surveying flood damage, and cocktails with legislators at the Illinois Governor’s Mansion. Pritzker, among the nation’s 400 richest people, needs sartorial suggestions? He’s not alone. Joseph Rosenfeld, a fashion and personal style strategist in New York who’s from the Illinois city of Buffalo Grove, maps out wardrobes with all his C-Suite executives. “It comes back to one basic premise: relatability,” he said. Pritzker spokeswoman Jordan Abudayyeh said staff members get suggestions from organizers of the governor’s events, but the governor ultimately decides what to wear. Fifty-five of the recommendations on the calendar, disclosed under the Freedom of Information Act, were simply, “Business: suit and tie.” Khakis, “button-down and pullover,” and “polo with Columbia jacket” also make the mix. The Democrat was advised to forgo neckwear when he hosted dinner for union leaders, but “Bring extra tie options” was the note on Feb. 9, the day of his official portrait. 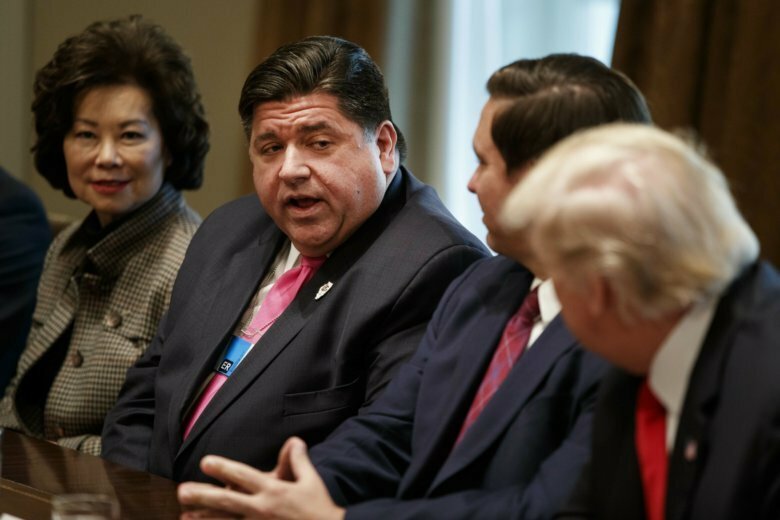 Despite his girth, Pritzker keeps his ties at a proper length, avoiding the long necktie look that President Donald Trump favors. While Pritzker often opts for a blazer and khakis, they’re typically crisply pressed — no disheveled “Mom jeans” like those for which former President Barack Obama was excoriated at baseball’s 2009 All-Star Game. Gubernatorial fashion in Illinois gets a lot of attention. Disgraced former Gov. Rod Blagojevich’s tailor regularly toted material swatches to the governor’s Chicago office. Gov. Pat Quinn had a “lucky” purple striped tie — more than one, as it turned out. Near-billionaire Gov. Bruce Rauner eschewed neckties with suits, wore big belt buckles, plaid shirts with rhinestone snaps, and a leather vest while astride his motorcycle. Democrat Quinn agreed that a governor dressed too casually “diminishes the person and the office.” He said his ties of purple, the color of mourning, were appropriate for the more than 300 military funerals he attended while he was lieutenant governor (2003-2009) and governor (2009-2015).